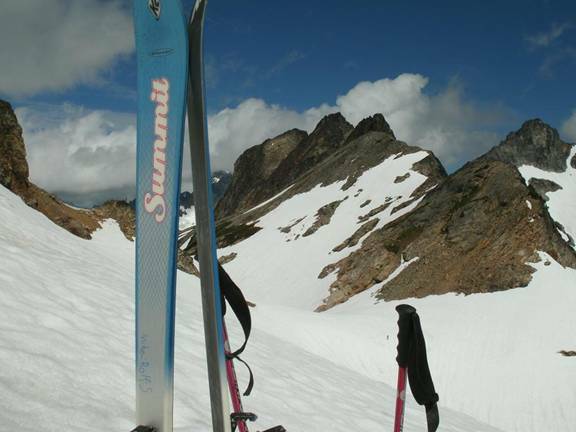 I had a great ski tour in the Spider Gap area on Sunday, July 31. 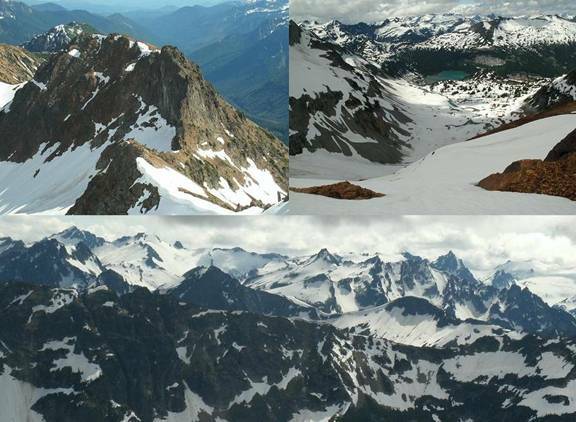 The difference between the snow this year (photo left) and the snow on a normal year (photo right) is amazing. I had day-hiked to spider pass four days earlier and looked down on the completely snow covered basin around Lyman Lake. 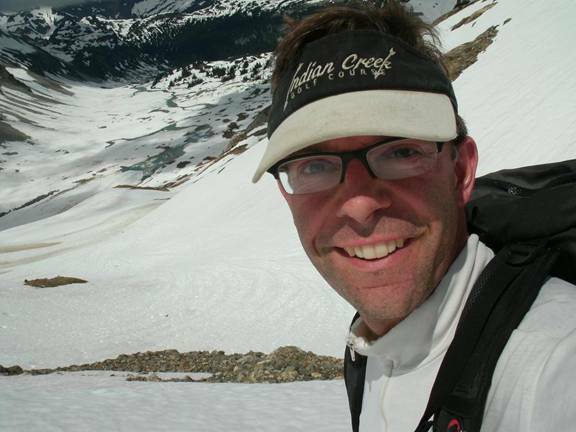 My objective today was to ski from Spider Pass down the gentle slopes to the upper Lyman Lakes at the base of Lyman Glacier, a run of 1,100 feet. 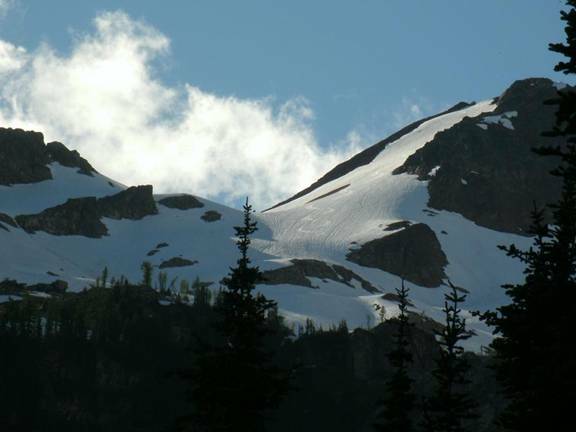 Then I planned to hike back up to the pass at 7,100 feet and ski the Spider Glacier back to 6,400′ and call it a day. My turnaround time would be 4 p.m. This would get me back to the car before dark. I left the car at 9:00 a.m. and walked in my sneakers to the bottom of Spider Glacier where I switched into my light telemark boots and walked on up to the pass. To save weight, I didn’t bring skins and it turned out that I didn’t need them. The snow was in perfect shape. Well consolidated, boots kicked easily into the corny surface, almost no slip-outs on the uphills. My plan fell apart before I even got to the pass. 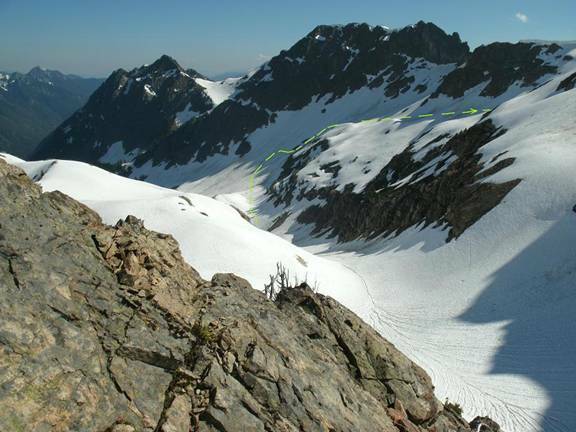 The snow was so good and I just couldn’t wait, so I climbed to the base of the rocks on the west side of the pass and got 200 feet of sweet corn that rivaled any spring skiing anywhere. From there it just got better. 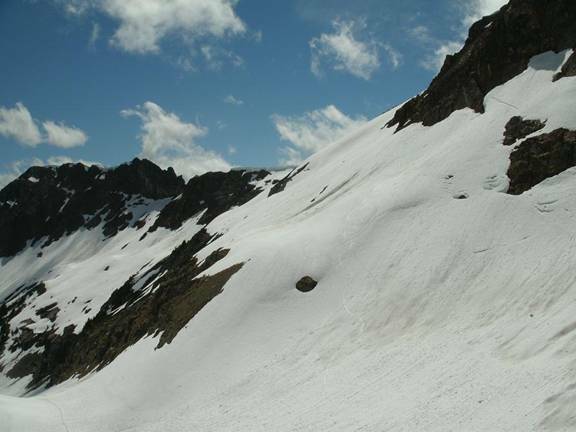 I walked on up to the pass with my skis on my shoulder and didn’t stop. The valley was calling and I couldn’t wait. 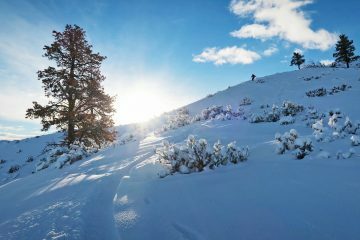 The skiing was worth the walk. 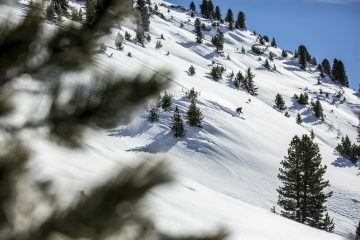 Clean snow. No pollen. No rocks. No suncups. Sweet sweet corn all the way to the lakes. 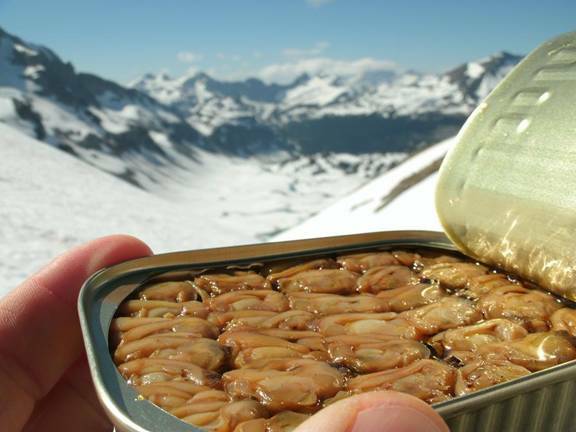 I had a victory snack of clams at the bottom of the run and loaded my skis on my pack for the walk back to the pass. The whole way back I just reveled in my good fortune. That was AMAZING! From the top of the pass I climbed to the high bit of snow east of the pass and skied the sidehills on skiers left down to where I had stashed my sneakers. This bit was 840 feet and was fair, not great skiing. 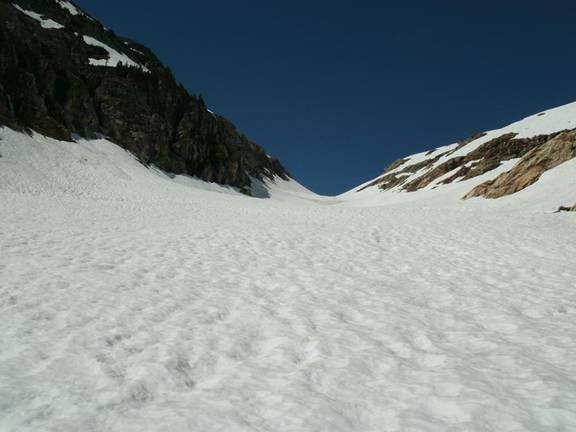 The glacier gully had some runnels and some suncups. Spider glacier and my route to the main course. …but the prize was the skiing. It was as good as the photos make it look. The folks watching from the meadow below could probably see the sun reflecting off my teeth because I was grinning and whooping the whole way down. I was back at the trailhead at 7 p.m. and home by 9. This tour is surprisingly mild, close to home, and good. It should get more traffic on skis. 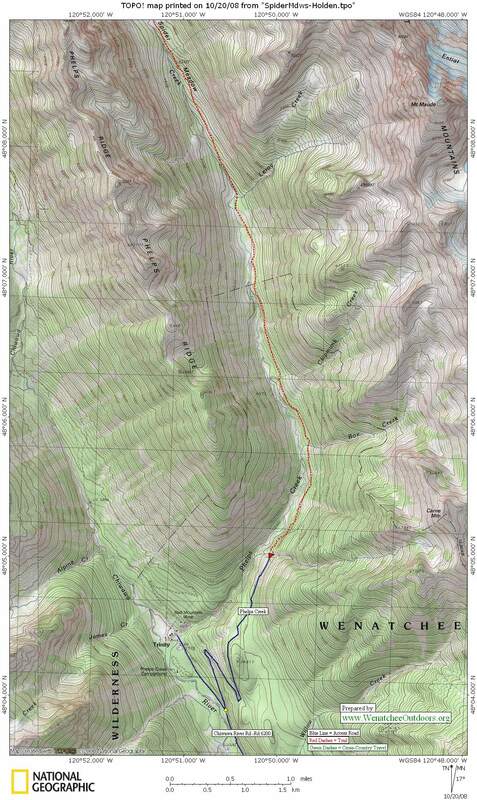 Topo Maps: See topographic maps of the area. 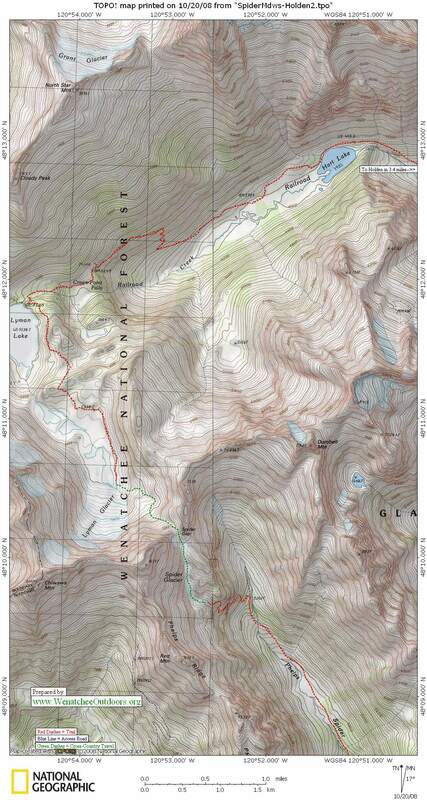 Map 1 (approach to Spider Meadows) and Map 2 (route to Spider Meadows and Lyman Lakes).